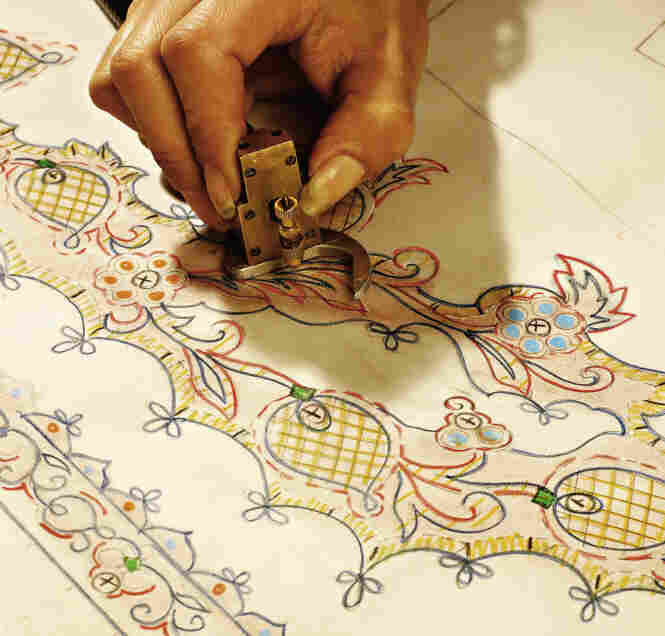 At Maison Lesage, Beauty Embroidered By Hand Exquisite creations for the world's top designers are in the works at a 130-year-old embroidery studio in Paris. At Maison Lesage, a small army of highly skilled sewers — affectionately called petites mains, or "little hands" — draw, sew and embroider for the biggest names in fashion. A friend's son recently got a tattoo — and she was appalled. Forty years ago, she'd given birth to a perfect, pink-skinned cherub. Now, bright blue wings, dark red hearts and some birds were inscribed on his bicep. Comfort, however, came in the words of France's top embroiderer: "It's human nature to want to look different," said Francois Lesage. "Self-adornment goes back to the Lascaux Caves! Think of scarification. That's the ancestor of embroidery." 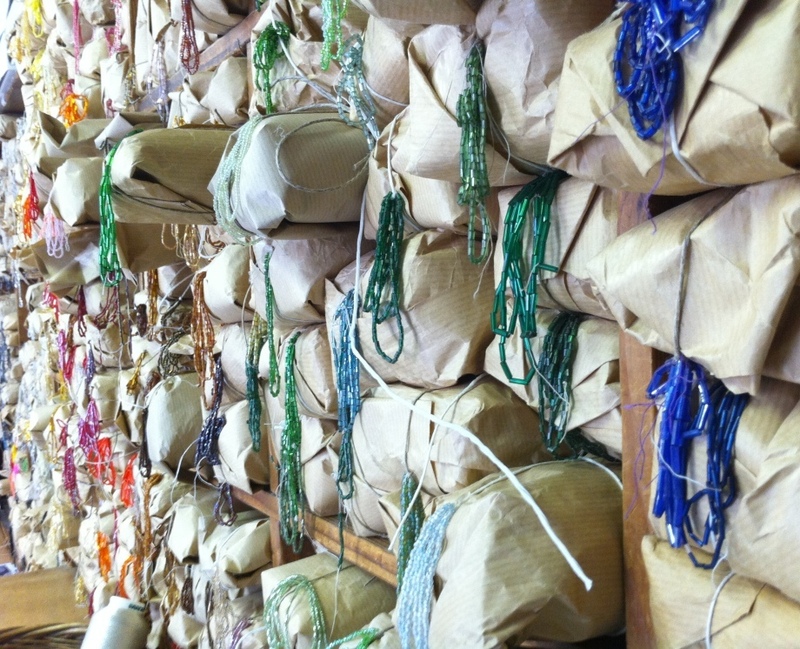 Beads of every imaginable color are organized in a rainbow of packets on the walls of the Lesage studio. Click here to see them up close. Adornment rules in a series of sunny rooms at Paris' oldest embroidery studio Maison Lesage — the House of Lesage. Workers in white lab coats attach sequins, beads, rhinestones, shells, ribbons and feathers to pieces of air-thin fabric ... which will adorn de luxe creations by the top names in fashion: Dior, Louis Vuitton, Yves Saint Laurent — all the famous French designers. The Lesage studio was purchased by Chanel in 2002. Chanel chief designer Karl Lagerfeld wanted to ensure that this 130-year-old embroidery business would stay in business, in a world of mass-produced, made-in-China clothing. The House of Lesage is a house of hand work. Executed by what the French call petites mains — little hands. They do it all. 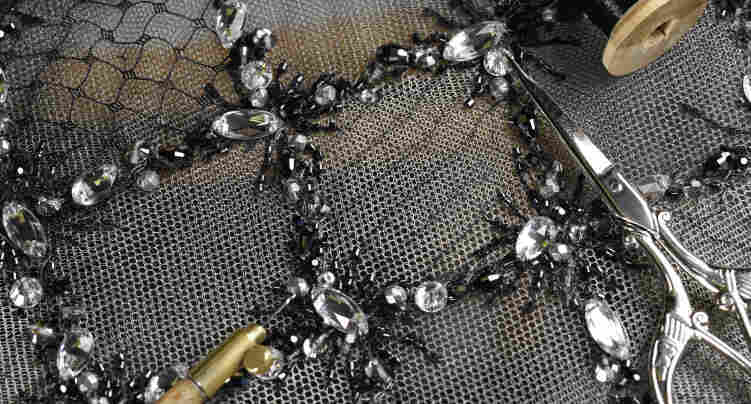 "The drawing, the sewing, the embroidery ..." Everything done by "very precious hands," says Chanel's Angelique Ginguene. Embroidering trimming for a long cream-colored gown by Dior, these precious and precise hands will hover their bead-bearing needles over thin pieces of tissue paper patterns, on which are sketched designs for just one small section of the dress. Eight different design drawings will be used just for the bodice of the gown. Petites mains — little hands, as they are affectionately called — are behind all of the studio's creations. 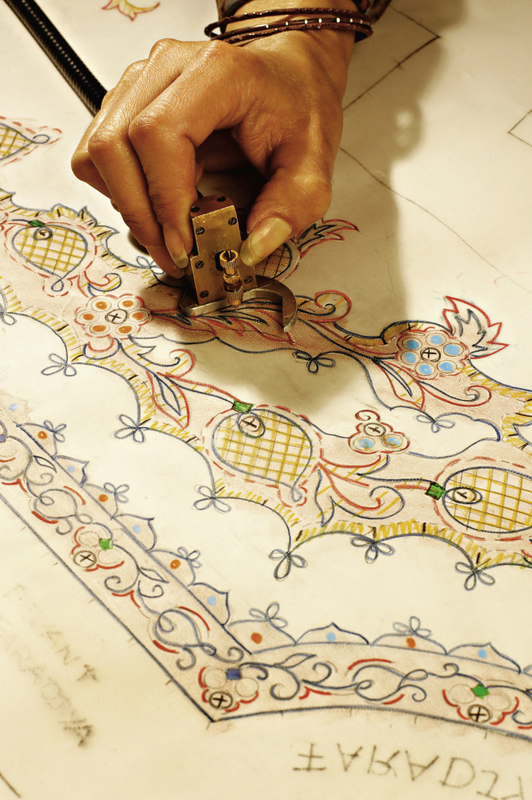 Designs are carefully drawn out before the sewing begins. 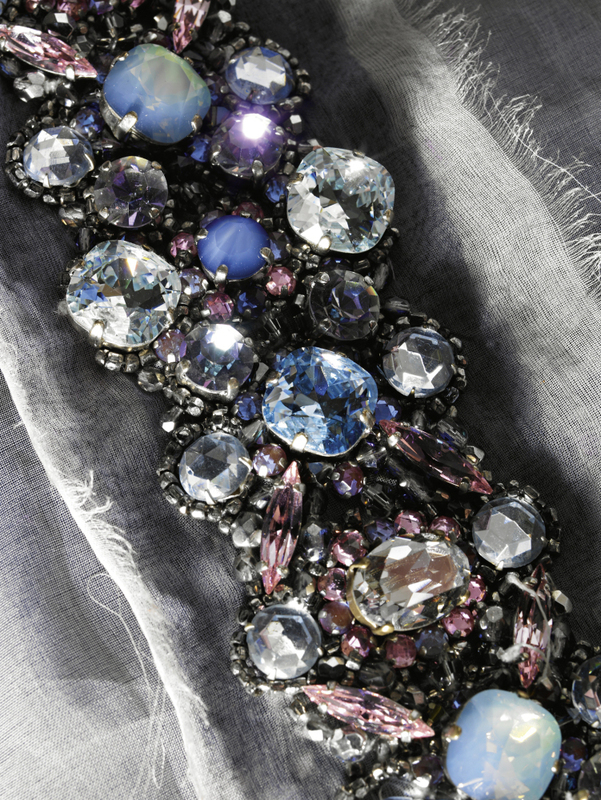 It's intricate and delicate work; if butterflies could sew, they'd work for Lesage. 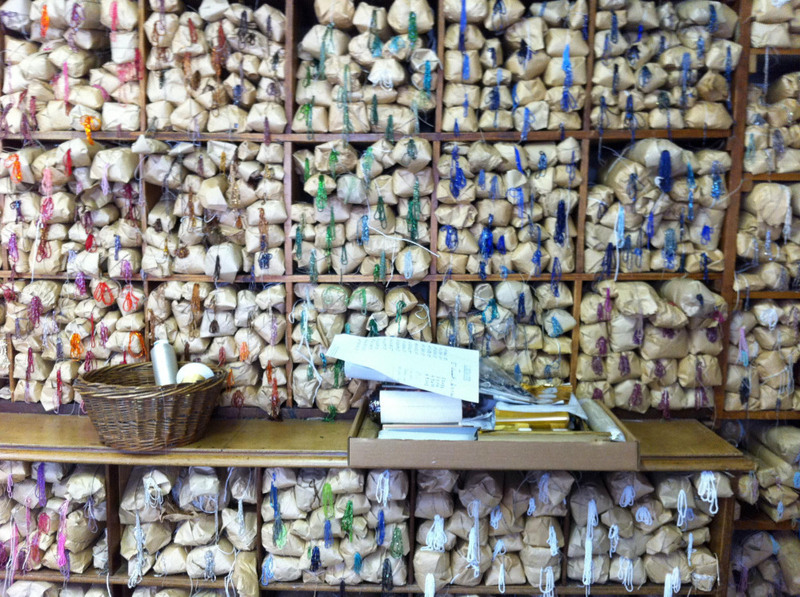 There are some 50,000 samples in the Lesage archive — it's a museum of embroidery. Studio shelves buckle with cardboard boxes marked Yves St. Laurent, Winter 1975 or Chanel, Summer 2003. Inside the boxes, samples of the embroideries Lesage produced for that particular seasonal collection. Examining just one small vintage piece, Ginguene rattles off the many different elements that went into the design sewn onto the flimsy muslin fabric: Cotton, gold cotton, red thread, brown thread, gold leather, gold pearls, paillette sequins. You can't walk in off the street and buy a yard of Lesage embroidery. It's all custom work, commissioned specially for a particular couture collection. The embroidery is the product of an ongoing artistic conversation between the designer and the embroiderer. Ginguene says that conversation begins with the designer's vision: Chanel's Lagerfeld might offer a single word like "trails" or "Russia." Lesage creations are exquisitely ornate; "I prefer to sell one dress for 100,000 Euros, than 100,000 dresses for one Euro," says Lesage. The inspiration can be anything, Ginguene explains. "A book, an image, just a word. For each fashion show, the designer has an inspiration." Lesage responds with 30 or so possibilities of which Chanel picks maybe three. But those three selections result in the most delicate, exquisite and improbable sewing. 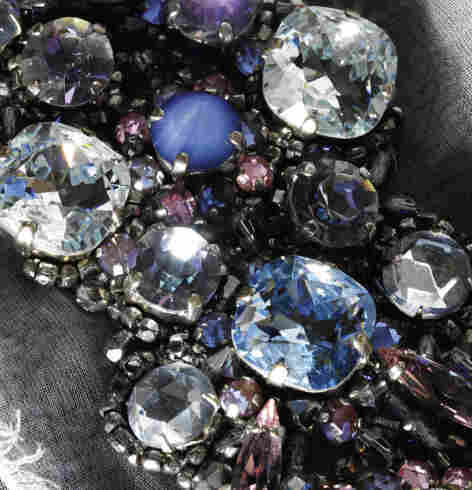 Hundreds of hours of handwork, thousands of sequins and beads, and miles of silken threads. These rarefied creations come, naturally, with rarefied costs. But at 82, Francois Lesage is philosophical about matters like price. "I prefer to sell one dress for 100,000 Euros, than 100,000 dresses for one Euro," he says, with a laugh. That 100,000-Euro dress (surely only a princess or hedge-funder would buy it) might be encrusted with gold ribbons, or silver braid, or jets. Packets filled with them are stuffed on shelves at Lesage. 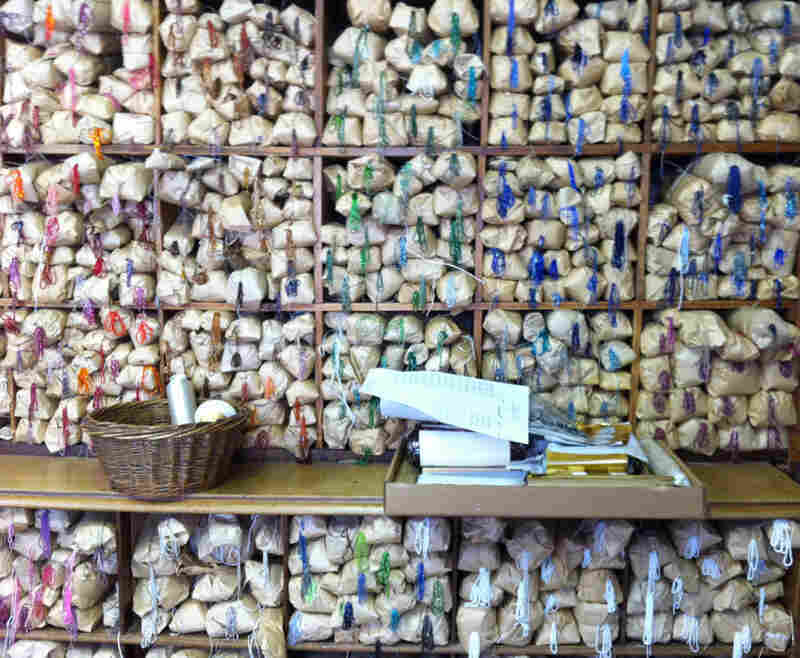 To get their supplies, the seamstresses visit the bead library, where the precise number of red or blue pearls are put into little transparent baggies and carried off to the big embroidery frames where the magic begins. Lesage says years back, in good families, all the girls had to sew. "You know why?" he asks. "To occupy them not to think of the boys — it's true!" 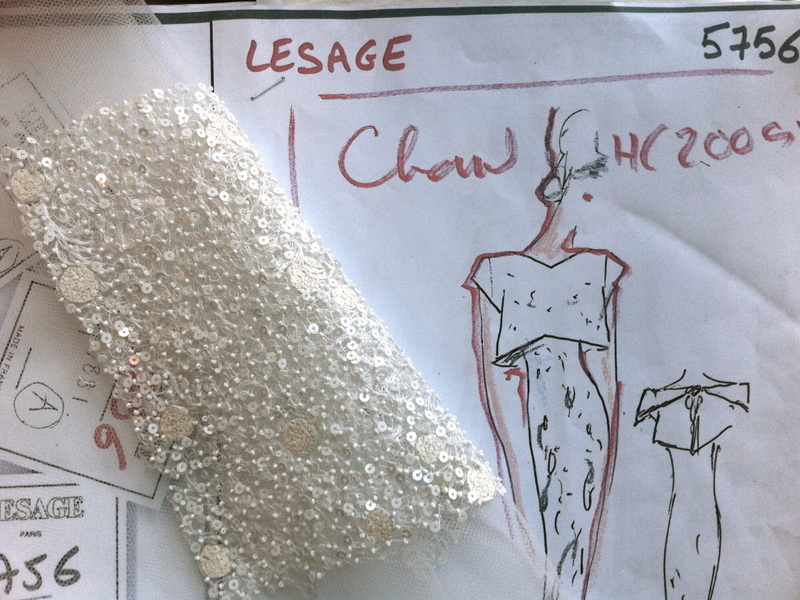 A sketch and an embroidery swatch for a Chanel dress that is in the works. Chanel purchased the Lesage studio in 2002. About 20 years ago, to keep his petites mains on salary and to perpetuate the art at a time of economic slump, Lesage started an embroidery school in this tranquil 19th century Paris building. One of his embroidery teachers — Marie-Lee Lyon — says she's fulfilling a life's dream at Maison Lesage. Even as a little girl, she dreamt of working in couture. Here, Lyon weaves her dreams in beads and sequins, and hundreds and hundreds of tiny invisible stitches. Lyon and her colleagues have skills which their boss admits he lacks. "I don't know how to sew a button," declares Lesage with a smile. Lesage's father Albert bought the family embroidery business in 1924 from a man who sewed for Charles Frederick Worth — thought to be the world's first high fashion designer. In the 1860s, embroidery was a hallmark of Worth's style — and the House of Lesage has extended that stitching tradition, now, into the 21st century.